The Double Quick Handle Rod Bloc from SHAPE features SHAPE's Quick-Lock Push Button technology. It consists of 2 handles that can rotate individually on a 360° axis, 2 levels of push buttons, a Bracket with Rod Bloc, and 2 arms.. The SHAPE handle and arm can be rotated by pushing the red buttons. Once the buttons are released, the handle is secured firmly in place. The Rod Bloc features a stainless steel locking mechanism for more durability. 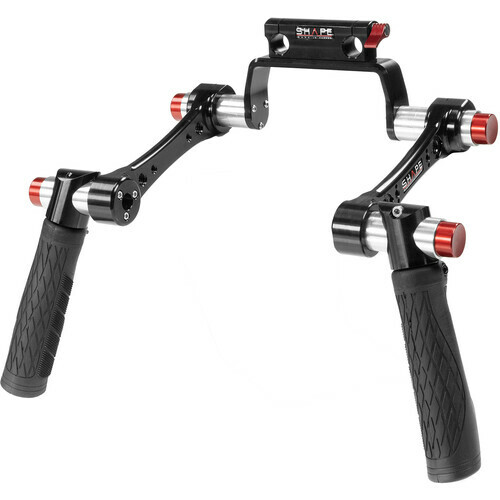 Providing a very solid grip, the Double Quick Handle with Rod Bloc can be mounted on the front rods of any camera support with a 15mm rod system. The handle is removable with one knob screw. It is constructed from CNC machined, high-quality aircraft grade aluminum parts, which are hard anodized for a resistant finish and assembled with stainless steel screws to prevent rusting. Box Dimensions (LxWxH) 21.0 x 7.4 x 5.2"